Although summer is still going strong, it is not too soon to start thinking about the coming seasons – the wise gardener plans ahead! 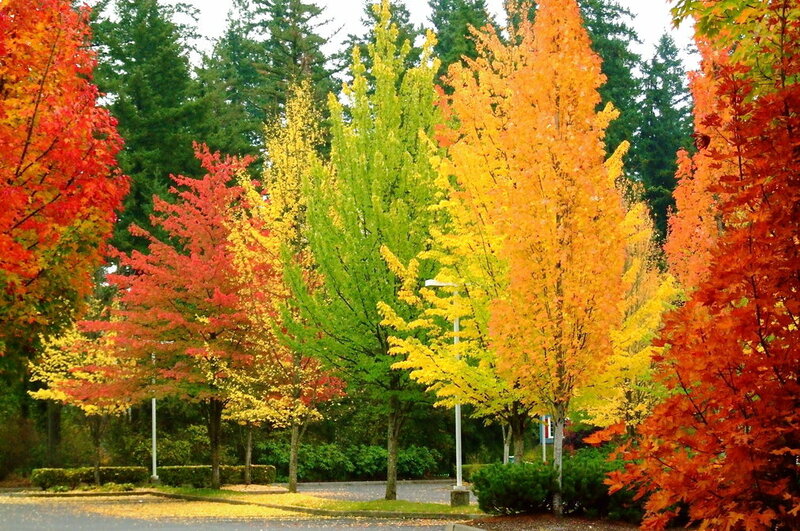 So with fall rapidly approaching this is a great time to start choosing and planting trees that will bring glorious color to your garden in what for many, especially in the north-east, is the best of all seasons. Part of planning your garden is to make provision for interest throughout the year and when it comes to the fall season, there are two or three ways to bring excitement and life to your garden. The most obvious and likely the first to come to mind, is with colorful foliage and there is certainly plenty to choose from in that area. Next are berries, which can make a lovely showing, as well as being food for birds and wildlife as winter sets in. Last but certainly not least are shrubs that flower late, bringing flowers at a time when the very surprise of their arrival makes their impact that much greater. With the first fall feature – colorful foliage – there are many plants to choose from, depending on where you live. The intensity of fall color in most trees is many a result of the difference between night and day temperatures. The cooler the nights, followed by warm days, the richer and more intense the color will be, which is why in cloudy, rainy falls the color can sometimes be a little disappointing. A dry fall, with clear skies at night will give the best results. Top choice must go the various Maples, and if you choose Sugar Maple you are in for a fireworks display of yellow, gold and red that will bring fall to a dramatic conclusion. Another great choice is American Red Maple and its selected variety October Glory Maple, both of which bring deeper, richer shades of red to your garden. A great choice for a fast-growing tree with reliable fall color is the Autumn Blaze Maple, a hybrid tree that is as tough and spectacular in color as its name suggests. Another native tree known for fall beauty is the Red Oak, which is actually quite a fast-growing tree and has rich reds and mahogany shades in fall that look perfect against the background of maples. Let’s also not overlook the Autumn Purple Ash tree, with rich purple shades that add a whole new dimension to the glory of fall. Of course these maple trees grow large and may not be suitable for smaller gardens, which is where the often-overlooked Amur Maple steps in. This tough tree, hardy to minus 40 degrees, makes a large shrub or, with a little training, a small tree that always delivers a wonderful show of red and gold every fall. For a smaller tree in milder areas, don’t overlook some of the Japanese Maples, with varieties like the Red Dragon Japanese Maple turning from its summer deep reds to dazzling scarlet as the cooler weather arrives. The Green Cascade Japanese Maple not only makes an elegant tumbling tree down a bank or over a wall, it will amaze in fall with its gorgeous yellows and vivid crimsons. All the Japanese Maples have the added attraction of being ideal for growing in pots, so even with just a terrace or the smallest of city gardens you can bring the beauty of fall to your home. Other often-overlooked small trees for fall color are the redbuds, with both the Western Redbud and Eastern Redbud rewarding us with beautiful golden leaves in fall. The Western Redbud is the most colorful, with the addition of many shades of red to a yellow base, making a beautiful display that can almost rival the astounding spring display of this tree when its bare branches are smothered in brilliant pink-purple blossoms. If you live in warmer areas then trees with reliable fall color beyond yellow are not so common. The best is certainly the Sweetgum (Liquidambar styraciflua), a native American tree that is found growing naturally from southern Connecticut to Florida and west into Texas, but which can be seen in gardens right across the warmer states. Its spectacular colors of red and gold rival the Maples with the addition of purples and smoky-browns, making for an unrivalled display. What is special about this tree is that it will color well even in areas where the fall nights are warmer and it can even be seen growing in warm countries like Australia. It grows best in damp, clay soils, so it is a perfect choice for those poorly drained locations. Solidly reliable choices for berry display that will last well into the winter months are the Holly Trees. These well-known evergreens are often seen as dense hedges, a job they excel at, but as fall arrives many become smothered in red berries that will be left by the birds until late winter when alternative choices are limited. This means they will brighten our gardens for months. A great selection for reliable berries is the Red Beauty Holly, which doesn’t even need clipping to naturally grow into a lovely pyramid shape and has been specially bred to give a heavy crop of bright berries. For a duel-purpose fall berry, consider planting the Aronia Black Chokeberry, which is covered in fall with berries of the darkest purple that not only make a great display but make a great jam too. This shrub does best in those damp spots in the garden and has attractive clusters of white flowers in spring. Although we don’t often associate flowers with fall, there are in fact lots of shrubs that either continue producing new flowers right up to frost, like the Crape Myrtle Trees, or hold their blossoms into fall, like many of the Hydrangeas, such as the Tardiva White Hydrangea, the Fire and Ice Hydrangea or the super-hardy Annabelle Hydrangea. With the Crape Myrtle Trees loving sunny, hot and dry locations and the Hydrangeas thriving in the shade, you can have fall blooms throughout the garden with just a little planning. Plant breeders are always working to bring new forms to the garden and today even that symbol of spring, the Azalea bush, can be seen blooming happily in fall too if you plant one of the Encore Azaleas. Choose between the purity of the white Autumn Angel Encore Azalea or the fine light-purple of the Autumn Lilac Encore Azalea, because whatever your choice you can be sure that these shrubs will grow steadily in size to become special features of your garden, bringing beauty at the most unexpected moment. Imagine how lovely your garden will look with Encore Azaleas in bloom beneath trees in their gold and red glory. Another shrub that can be relied on to keep blooming well into fall is the Butterfly Bush. If you choose the traditional varieties such as the Royal Red Butterfly Bush or the Pink Delight Butterfly Bush, you can be sure of flowers right up to the first hard frost. Remember to remove dying flower heads through the season to get the best continuous display possible. If you live in an area where spread of this plant is a concern, then plant some of the new, seedless varieties such as the Blueberry Cobbler Butterfly Bush and the Asian Moon Butterfly Bush and have no fear of hurting your local ecosystem. So with so much (and so much more!) to choose from, it is really easy to plant trees and shrubs that will stand out in fall and make sure that the ‘season of mists and mellow fruitfulness’, as the poet John Keats aptly described it, is a time of color and promise in your garden that will keep your spirits high through the darker days of winter until spring rolls around once again.